There are 6 posts in this thread, and it has been viewed 6696 times. 3 Count Bout. What do you think of it? This week we let the ring shake just like Hulk Hogan, Randy Savage or Andre The Giant once did. 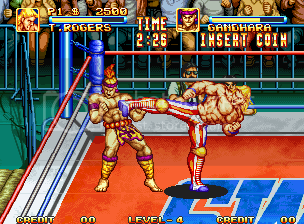 With characters in it like Big Bomberder, The Gandhara or Gochack Bigbomb, SNK finally released their own wrestling Neo Geo game in 1993, just like Capcom did with Saturday Night Slam Masters in the same year. Select a promising wrestler, get in the ring, perform your pile drivers and submit your score at Priest's High Score Challenge! Then come over here and tell us what you think about it. 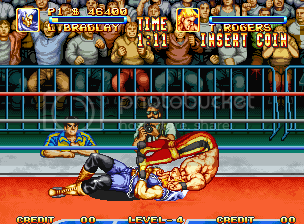 3 Count Bout, known in Japan as Fire Suplex, is a wrestling arcade game released by SNK in 1993. The game consists of 5 championships with their own stages. The first stage type is a boxing ring where the opponents can bounce from the edges and can be out of bounds. 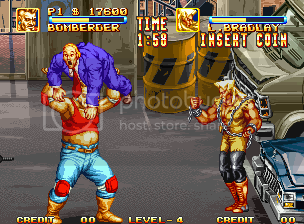 The second stage type is street wrestling, where there are objects to destroy and weapons to wield. Back in '93 I remember seeing this game at a grocery market my mom frequented. I would try it every once in a while and I generally liked it. The AI is so cheap, so I never won though. Trying to break a pin seems impossible and bouncing off the ropes/bouncing others off the ropes seems hopeless since the CPU will find a way to fully capitalize on the opportunity. I liked how there were different stages, although they're pretty generic (random, ghetto street, alley way etc.). I also liked the variety of wrestlers. I recently did this and managed to beat the first round! It was all downhill from there though. I would assume it's much more fun in competition mode. but enjoyed the skill on offer in the embedded video in the opening post. 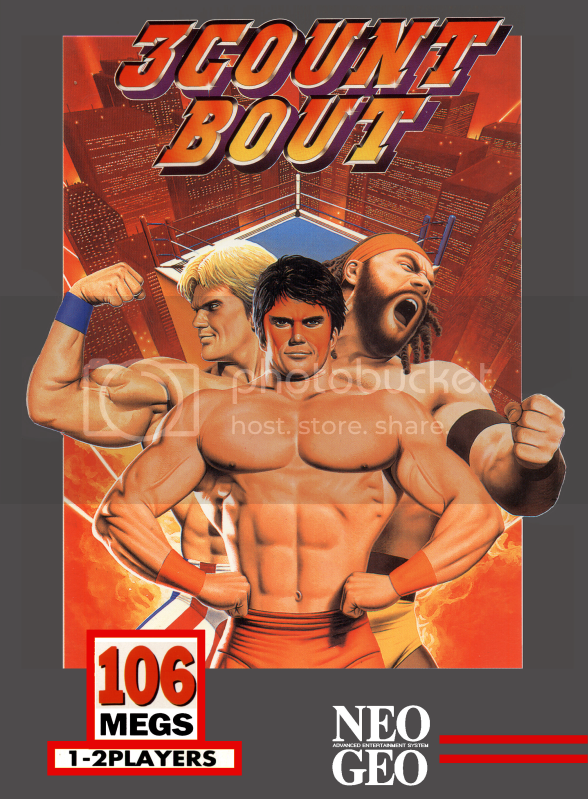 Generally, I won't touch Wrestling games, but as is usual with SNK, they've managed to make me look at the genre with their slant on it - and it looks like fun. As long as it's not over-priced, I might even pick this up at some point for some extra fun... for something less serious. After all, there's nothing like having a few extra 'filler' titles on that shelf... eh Merlin? The AI is so cheap, so I never won though. Trying to break a pin seems impossible and bouncing off the ropes/bouncing others off the ropes seems hopeless since the CPU will find a way to fully capitalize on the opportunity. Even the graphical presentation is pretty good, the sprites are huge and the stages colorful and innovative. But then there are flaws here and there that just leave a sour taste, like the earlier mentioned difficulty or tedious grapple attacks of the opponents. At some points it reminds me of King of Monsters too, if some gameplay features would have been worked out, both games surely would be better over-all. The gameplay hampers the game as a whole, yes. This is sad because gameplay is the "meat" of a game. KotM plays better, IMO. I could beat the first stage with one coin. It also allows you to continue exactly where you left off. Plus, the whole "2 on 1" idea is really cool. I don't know why, but I always confuse 3CB as a game made in '91... Maybe it's because of the overtly simplistic gameplay (for the time). I had really hoped for more from this one but sadly, its flaws prevent it from being anything more than average. The graphics look great in screenshots but in motion the animation is sorely lacking. When you're grappling with your opponent there is no animation of the sprites whatsoever and you have no clue who is gaining in the struggle. It's got a decent roster of characters but much like those old He-Man figures from the 80's, there are a few that are simply different heads on the same body or straight-up palette swaps. The AI is just nasty in terms of difficulty and trying to pull of any of the more complicated techniques it will interrupt and punish you if you if you fumble for even a moment. Being pinned can be really frustrating too as it feels like you have very little influence on whether or not you'll be able to kick out and escape. 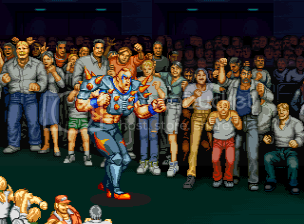 I do like the stage variety and the "street brawls" are kinda fun. The character entrances to the ring are very cool and a nice, authentic touch! I've never gotten much past four matches into the game but will still come back to it from time to time. It's not too expensive on the AES and given that it's the only proper wrestling title on the Neo it's worth a try if your willing to be patient with the unforgiving difficulty and stiff animation. Overall a decent game which I'd hoped would be better.